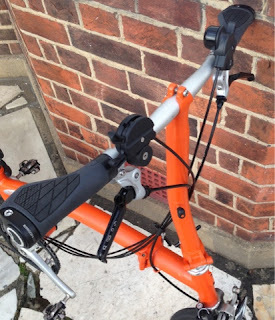 Regular readers will undoubtedly know that my Titanium Orange Brompton has been undergoing change. Today I took possession of my beloved titanium one and was rather pleased with what I saw. My M-Type has become an S-Type. I know what some of you are possibly thinking. Why didn't he just get an S-Type to begin with? 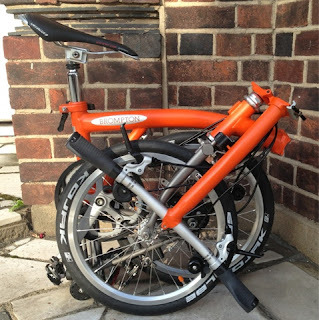 The truthful answer is that at the time I bought my Titanium Orange Brompton I didn't want one. I wanted the more upright M to cater for all types of journey. I wanted the classic shape that is the M-Type. I wanted the M-Type as it represented the original handlebar shape that has become a design classic. I thought that it would be an all rounder, catering for all my cycling needs. The change from M to S if I am being truthful is something I have been deliberating upon since I took possession of my newest Brompton bike. 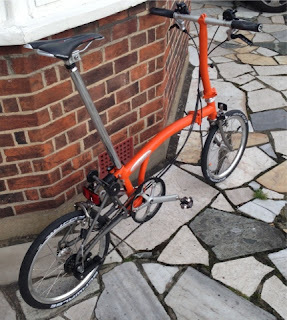 I sold my Raw Lacquer S2L in order to part fund my Titanium Orange Brompton. If you have read or care to read my blog posts on that particular bike you will discover that I absolutely loved it. It didn't take me long to start missing the elegance of the S-Type and speculating upon whether I had made a mistake? So, the decision to change to an S-Type was made several weeks ago. The more I tinkered with my Titanium Orange Brompton the more I longed for it to be an S-Type. Funds did not allow until recently but as soon as they did I bought the parts required and did not look back. Taking them to the place I bought the bike in the first place, they were able to complete the transformation swiftly and I now have the Brompton I dreamt of and dare I say should have ordered in the first place? I have written about the how I see my Brompton bikes being used for very different tasks. The Original Orange Brompton (a bike I would never sell) will be my commuting hack and terrible weather Brompton. 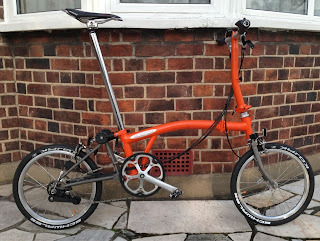 My Titanium Orange Brompton will be everything else. It will come out to play for weekend rides, training runs, Brompton Club rides, adventures, night rides and of course racing. 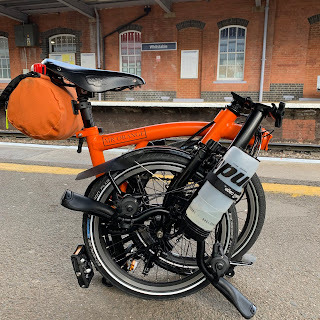 Despite my Original Orange Brompton being my sole means for transport to and from work it will actually do less miles a month than my Titanium Orange Brompton. Initial impressions are very favourable. I love this bike! What was a great bike as an M is transformed into a wondrous S. Although only over 100g lighter, psychologically the brain is fooled into thinking the bike to be lighter than I recall. The handling is good with steering responsive and nippy. Happy memories of my S2L flooded back. Trying to ascend a very steep hill proved to be easier than on my M perhaps as I felt more stable and confident when riding out of the saddle. As for looks, to my eyes it is a beauty. There is something about the S-type shape that is filled with a sense of élan. What will I do with the old stem and M bars? Well they won't be going back on my Titanium Orange Brompton - ever. I might put the orange stem on my Original Orange Brompton. After all, you can never have enough orange! Looks great - very sharp. I notice that the rear tyre doesn't touch the frame when folded - is that specific to the Kojac tyres? Great blog by the way! Hello hello Carlton. Quite possibly due to the Kojaks. They are a smaller profile tyre than the standard ones or Marathons. I see some winning positions coming up! Looks great -- has a very light, quick look to it. It's been a joy to watch the evolution! I also love the new blog header picture, even though it's pre-"S-Type". Thanks for posting.. Many thanks. Will be taking a few pics of the new version soon. Looks good, did you need to buy shortened brake cables? Presumably you do'nt or wo'nt use a bag on the front of this one? Hello Laurie. Didn't shorten the cables as I had a set of S-type cables. I do like that. Can you tell me roughly how much a conversion kit costs, where you get it, and more importantly, can it be done at home, or did you have to take it to a shop to do? Hello Gareth. As the blog post says I decided to take it to the shop I bought the bike. The stem and new S bar came to about £120 and it is actually a job you can do oneself. You just need to make sure the cables are routed the right way (take a before and after photo). The S-type isn't for everyone and my commuter bike is my Original Orange Brompton M6L. Thanks for a great site. I live in New Zealand and we have no Brompton dealers here so it's great to get information from your blog. I want to change my M3L to an S-type. I see the brake cables need changing but what about the gear cables? Hi there Ellie. All the cables would need replacing as they are a different length on the S type. He best thing would be to buy a set from an online seller or get them fitted at a local bike shop. Brompton cables would be e way to go as they require no cutting and are exact length. Keep reading. I've got a P-Type and want to change the handlebars to an M-Type. I do have the actual M-Type handlebars but when I tried to remove the P-Type handlebars from the stem it looked like I have to cut them and not sure I can fit the M-Type without potentially damaging the stem. Do I need to replace the handlebars together with the stem ? If you want to convert from a P to an M ideally you need to replace the P type stem for an M type stem (which is slightly taller). Remember you'll need a new set of cables, although you could cut them to size if you are able to.